First, old school advertising still works. At present, I live near a White Castle which I drive by 2 – 6 times per day depending on where my projects take me. 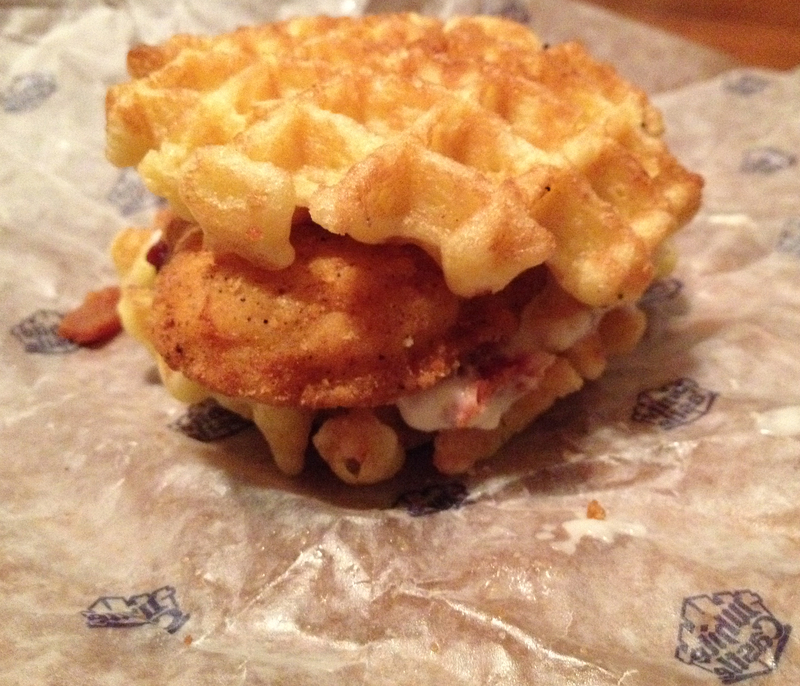 Over the last week I perpetually passed by a sign for the new White Castle Chicken and Waffle sandwich. I did not want the sandwich. I needed the sandwich. How could I resist trying a fast food interpretation of an American classic, Chicken and Waffles. So, I made my move, picked one up and brought it home to evaluate and rate with my able assistant CMH Tobias. My first thought was that the waffle was good. I had expected a Leggo my Eggo style waffle but the sandwich features a real deal, Belgian style waffle. It was neither too soft nor too hard. It fell in to the Goldilocks zone of just right. (A bit of post consumption research indicated the waffles originate from a company in Belgium which had been in the business since 1932). The gravy and bacon bits were an afterthought on my sandwich but complemented the flavor profiles well. Their true purpose is to serve as a brick and mortar to hold the sandwich together. The chicken patty was lightly breaded and kind of meh but still palatable. All together it was an acceptable fast food sandwich. I would not rush to get it again but I don’t regret my choice. I respect the effort made to try something different and off the beaten path. The only negative I can hone in on is the price. It was not worth $2.69. I’d say $1.99 might be fair market value. I offered CMH Tobias an opportunity to try the sandwich. His approach was different from mine. He ate the waffles first and the chicken second. I can’t say he wolfed it down as quickly as other items, but from our long-standing relationship and shared understanding, I believe he would rate the sandwich a B. (For future reference Tobias’s hierarchy of food starts at ice cream, then cheese, rawhides, almonds, beef, squirrel meat, other meat by products and then dog food). 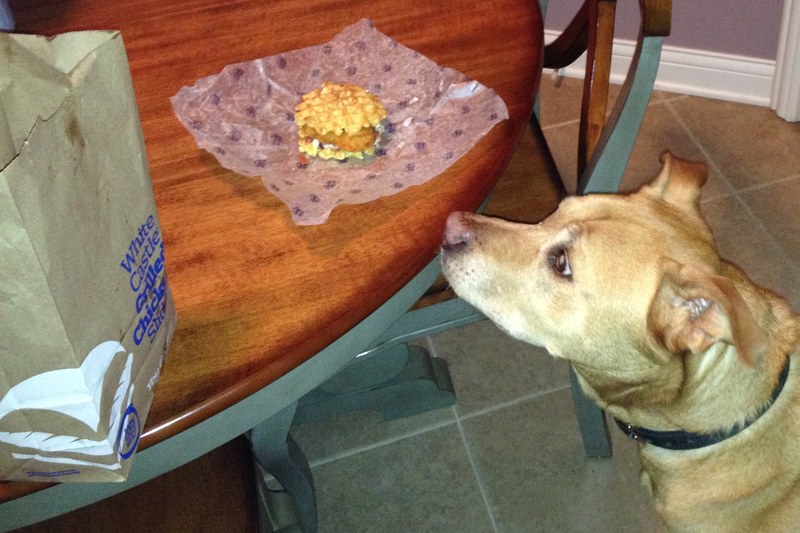 Since Toby refuses to participate in the labor economy he had no opinion on the price of the sandwich. And now the editorial. White Castle gets a lot of snarky comments and snickers from a significant segment of society. I don’t think it is deserved. I’ve always had a soft spot for this underdog in the fast food wars. For the most part, the company has quietly gone about its business under the shadow of the Wendy’s, Burger King and the like. However, White Castle has done a lot of earn my respect. I’ll highlight a few of the items of note. The company started in 1921 in Wichita, Kansas. It moved its corporate headquarters to Columbus in 1934 and has remained here as a family owned business for 70 years. That’s pretty local in my book. White Castle was among the first employers to hire women and minorities. It was the first fast food restaurant as we know it. It has countless patents and food service inventions credited to the company. It has no franchises, each location is company owned. White Castle inspired a movie. So next time someone snickers at a slyder let them know you are proud that a local company has continued to stay in Columbus and stay true to its origins. This entry was posted on April 28, 2014 at 8:14 PM	and is filed under Columbus, culinary knowledge, Food For Thought, sandwiches. You can follow any responses to this entry through the RSS 2.0 feed. You can leave a response, or trackback from your own site. I love this story! And I agree with your assessment of White Castle. I confess, the only thing I have ever eaten from there was onion chips. But when I was in my 20’s and staying out late drinking was my thing, they sure tasted great and really hit the spot! You are so correct to note that it doesn’t get much more local than Whitey’s! And where do people think the term “sliders” (which are now as ubiquitous as French Fries) came from? White Castle burgers are the original sliders. One other point I will add to your editorial. Dig around a little bit and you will discover than the Ingram family (which founded and still owns White Castle) has done quite a bit of good for this town. Here is the link to its foundation, managed by the Columbus Foundation. http://columbusfoundation.org/giving/foundations/ingram-white-castle/ Its stated mission is ” to provide nourishment to those throughout central Ohio who hunger for knowledge, independence and self-sufficiency. Our emphasis is on efforts that empower young people with the desire for self-improvement, and full participation in a free society.” White Castle lovers can stand tall knowing that not only is it a corporate leader and icon, but also a strong local team player. A quick look at the Columbus Foundation website and I found that since its establishment in 1949, the Ingram – White Castle Foundation has contributed over $22 million in grants back to the local community. I love White Castle because they make the sliders right there in front of you, and with a surprising lack of processed crap. Breakfast is even better, since they’re making the eggs fresh for each order. They’re one of the few fast food places my wife and I eat at regularly these days. Also got to note that WC avoids a LOT of processed crap in their foods – my wife is pretty sensitive to a lot of food additives, and she can eat sliders or breakfast sammiches from WC without any problems. (She actually loves their breakfast, because you can watch them cracking and making the eggs for your sliders right in front of you.) They’re one of the only fast food places we eat at on a semi-regular basis at this point. Err. Fast food, not fat food.